Specialty equipment was required to drill through the buried rocks underneath this foundation. Engineered Foundation Technologies (EFT) mobilized a portable drill rig and crew to install 32 drilled hollow bar micropiles to stabilize a settling foundation. The twenty-five year old house had settled almost a foot and was severely out of level. The site contained about 15-20 feet of buried blast rock fill. The difficult soils would only accommodate a drilled piling system capable of advancing through the rock fills. EFT selected Contech's hollow bar micropiles to ensure full capability of drilling through the buried obstructions. 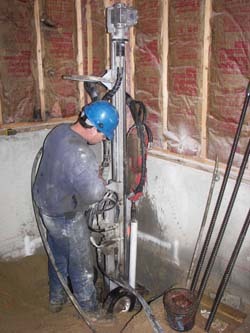 CTS/Titan hollow bars are installed using the injection bored method, which involves pumping at pressure a cementitious grout while the CTS/Titan hollow bar is drilled into the grout. The micropiles advanced between 10 and 22 feet below the foundation and anchored into the underlying bedrock. Six of the piles were attached to the existing foundation wall with a specialty underpinning bracket as designed by Earth Contact Products. The piles were designed for an ultimate load of 30-kips each. The geotechnical construction was successfully completed in 8 working days.